According to The National Institutes of Health, nearly 12,000 babies are born each year in the United States with a hearing impairment. It is estimated that serious hearing loss occurs in about one to three of every 1,000 healthy newborns, and in two to four of every 100 babies in newborn intensive care units. Without screening or testing, hearing loss may not be noticed until the baby is more than one year old. If hearing loss is not detected until later years, there will not be stimulation of the child’s hearing centers. This can affect the maturation and development of hearing, and can delay speech and language. Social and emotional development and success in school may also be affected. Most hearing loss is congenital (present at birth), but some babies develop hearing loss after they are born. 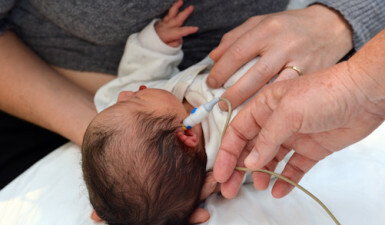 Hearing loss is more likely in premature babies and babies with respiratory problems who have required long-term use of breathing machines, those with previous infections, and those taking certain medications. Because of these risks, many health organizations including The National Institutes of Health and The American Academy of Pediatrics now recommend universal infant hearing screening to check all newborns for hearing loss. Most often, parents are the first to detect hearing loss in their child. Unfortunately, many children with severe hearing loss from birth are not diagnosed until two and a half or three years of age. Some children may not be diagnosed until four years of age.